Marlin Jensen • Former historian for the LDS Church. 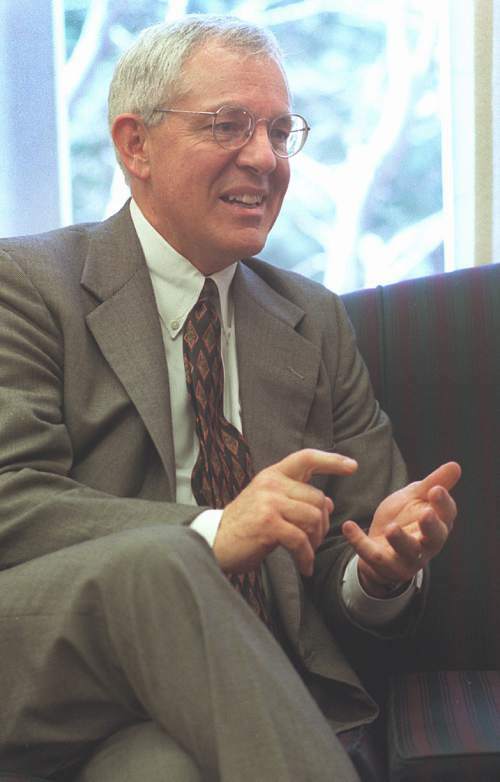 Marlin K. Jensen was one of the most popular and respected LDS Church historians in recent memory  both within the Utah-based faith and among outsiders. It seems fitting, then, that the University of Utah has created a fellowship named after the emeritus general authority, who was Mormonism&apos;s official historian and recorder from 2005 to 2012. Earlier this month, the U.&apos;s Tanner Humanities Center announced plans to raise funds to create a fellowship to honor Jensen. The hope is that the "Marlin K. Jensen Scholar and Artist in Residence Program," a news release said, "will host prominent scholars and artists with expertise in Mormon studies." "I have known Marlin Jensen," Tanner Humanities Center Director Bob Goldberg said in the release, "for more than a decade. He brings to every situation a deep integrity, wisdom and desire to repair the world. He inspires trust and the sense that people of goodwill can accomplish anything that inspires them." During his leadership tenure with The Church of Jesus Christ of Latter-day Saints, the release said, Jensen "worked to professionalize the church&apos;s History Department, give it international range, make its holdings more accessible to researchers, and publish primary materials." Jensen, a graduate of the U.&apos;s law school, left his church office as an emeritus LDS Seventy in 2012 and returned to his work as an attorney. He currently sits on the state Board of Regents. The fellowship in his name will consist of a "semesterlong residency tailored to a specific scholar or artist," the release said, who will "serve as a research or artistic mentor, teach workshops or classes, and contribute to Mormon studies curriculum planning and program development." The goal is "to raise $50,000 for a pilot year program," organizers said. "If successful, we will offer this program for three years, for a total cost of $150,000."